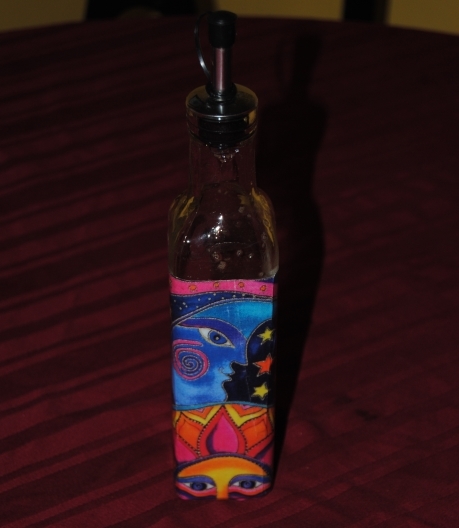 While at the new Joann Fabric Store the other day, I found this great little glass bottle with a liquid dispenser top. It was a bargain at only .99 cents! Seeing the dispenser, reminded me of a wine bottle re-purpose I saw on Pinterest from the Mom 4 Real Blog. It took a wine bottle and restyled it into a liquid dish soap dispenser. I thought this was pure genius and it looked great! 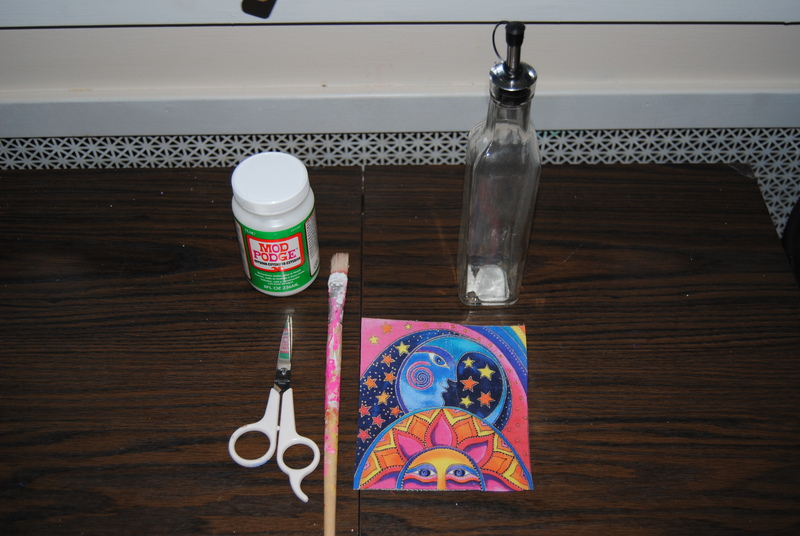 The only problem for me was counter top space, so rather than use a wine bottle for my attempt at the project, I decided to use this smaller square glass bottle. A simple decoupage restyle was in order! I gathered up the items I would need to make this project happen. I decided to go with a celestial themed print I loved, and it matched the colors in my kitchen perfectly! I decided to use Outdoor Mod Podge for this project. My reasoning behind this was the close proximity this bottle would be to the sink. I thought it might hold up better with the added protection. I simply printed the image, cut it out, and glued it to the glass with the Mod Podge. Once dry, I then added 2 more coats over the image to seal it. I believe the liquid/stopper/dispensers are sold separately so any glass bottle in which one of these stoppers would fit the opening would work for this project, a wine bottle is a fine example of that. I posted a photo below of the finished product. This was an easy project and I am loving the whimsical celestial imagery! Beeeeautiful. Gave my day the lift I needed. AND something to do with the pretty bottles I sometimes don’t wanna let go. Thanks! : ) So many ideas for re-purposing glass bottles online. Very cool! I love the image you chose–it has the perfect touch of whimsy to it! It’s lovely! Good call on the outdoor mod podge, too. I didn’t even know they made it.